UrbanTheater Company is at it again. After a successful Midwest Premiere in 2011 of Beauty of the Father by Pulitzer Winner Nilo Cruz, UrbanTheater Company (UTC) continues season six with the highly anticipated production of F****** A, by Pulitzer Prize and MacArthur Genius Award recipient, Suzan-Lori Parks. F****** A will be performed in association with Pegasus Players’ new home at 4520 N. Beacon Street, formerly the historic Hull House. You can catch F****** A at the UrbanTheater Company on March 20 through April 20. 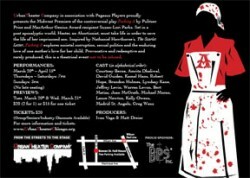 For more details on dates, times, ticket prices, visit www.UrbanTheaterChicago.org.